The update will allow the car to perpendicularly park on its own. It also gets rid of the speed cap on autosteer and make it smoother. It uses hardware that tesla have been adding to their cars since october 2016. New teslas have 8 cameras providing 360 degree coverage for 250 meters. Better processing with the radar sensor allows it to see through rain, fog, dust, and even another car. The 12 ultrasonic sensors were updated to sense hard and soft objects at twice the original distance. The new cars are using nvidia’s drive px2 that has 40 times the computing power of the previous computer system. Elon musk says by the end of 2017 teslas will be fully autonomous. A government report found that the first generation autopilot system reduced crash rates for tesla cars by 40%. 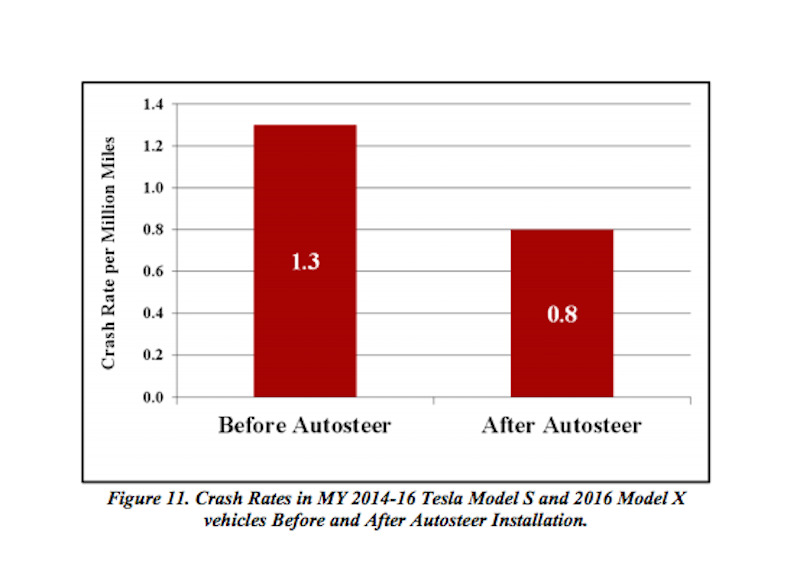 When tesla first release autopilot they recieved lots of criticism with people saying that it is not ready and it will endanger people but the results are quite the opposite as there was a substantial decrease in crashes. At the beginning every time there was a crash while a tesla was on autopilot it is seized upon as proof of how unsafe autopilot is but it seems to me now that was just confirmation bias. Self driving cars have long been theorized to decrease car accidents but there have been lots of resistance from people who are skeptical of that saying computers can have errors etc but we are now recieving proof of that theory and that humans make errors more than computers.